How to Get Paytm Bank Physical RuPay Platinum debit card? 3- Once your Card has been delivered to you, it can be activated by scanning the QR code on the back of your card from your Paytm App. How to Get Rs 60 cashback on your cash withdraw and Pos transaction ? 1.Swipe your paytm debit card at pos or withdraw money from Atm above 250Rs. 2.For every transaction you will get 20 Rs cashback for First 3 transactions. Offer will start at 23:59 (11:59 pm) on 06 April 2018 to 23:59 (11:59 pm) on 30th April 2018. This offer is only valid for customers using their Paytm Payments Bank Debit Card for the first time for POS machine swipe or ATM withdrawals. If a customer has already used their debit card for POS machine swipe or for ATM withdrawal before 11:59 pm on 06 April 2018, then they are not eligible for this offer. Rs.20/- will be credited to user’s Paytm Payments Bank savings account on each of their three first transactions. Thus, a customer can get a total of 60/- cashback across three transactions Eligible transactions – Offer is valid only on POS machine card swipe and 1 ATM withdrawal of ?250 and above. do 3 POS machine swipe transactions within the duration of the offer. ATM withdrawals and POS machine swipes can be done in any order.Only successful eligible (defined as above) transactions completed during the offer period are valid i.e. only transactions completed between 23:59 (11:59 pm) on 06 April 2018 to 23:59 (11:59 pm) on 30th April 2018. If a customer only does two transactions between this period, then they will only get ?20/- + ?20/- = ?40/- cashback. ATM withdrawal can be in ATM of any bank. Cashback will be credited to user’s Paytm Payments Bank Savings account within 10 days of transaction through Debit card. This will be per transaction basis. e.g. 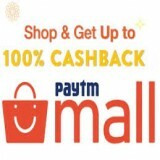 cashback of ?20/- for the first eligible will be credited within 10 days of the first transaction, cashback of ?20/- for the second transaction will be credited within 10 days of the second transaction, and so on. This offer is valid for a limited number of users.